Kenji Mizoguchi, who was born in 1898, was already directing silent films in Japan at the age of 25 and by the time he was 38 had some sixty credits to his directorial resume. But none of those earlier films, which must perforce have been shot on very limited budgets, have survived, and today there are only post-1936 films of his available. Since Mizoguchi came to be known as Japan’s greatest director, this figures to be a considerable loss, but at least we can be reassured by Mizoguchi’s later observation that his career as a serious director didn’t really begin until the making of Osaka Elegy (Naniwa Erejî) in 1936. 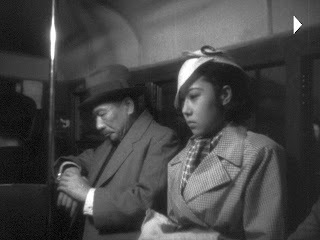 This film already featured a number of Mizoguchi’s characteristic narrative themes and also marked the beginning of his long-time, fruitful collaboration with scriptwriter Yoshikata Yoda. The plot of the film, based on an original story by Mizoguchi, himself, concerns the misfortunes of a young woman who sacrifices her position in society and her chances for future happiness in order to provide financial assistance to her male family members. 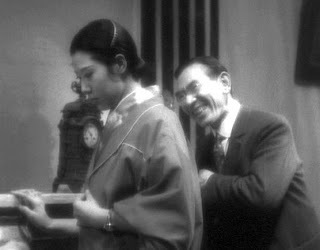 It seems to parallel some of Mizoguchi’s personal history, since his own father’s failed financial investments ultimately led to his elder sister being sold into prostitution as a geisha. This sister then helped provide financial support for her teenage brother who was about to enter the film industry and achieve everlasting fame. Establishing Ayako’s Dilemma. In the opening sequence, which is very static, Sonosuke Asai, owner of the Asai Pharmaceutical Company, is shown in his wealthy home demonstrating his general irritability and dissatisfaction with his domestic life. He and his wife make no bones about being unhappy with each other. The action cuts to the Asai Pharmaceutical office, where Ayako, a pretty telephone operator works and is admired by handsome young coworker Susumu. In addition, she is not only admired but also discretely propositioned for sexual favors by two senior managers, Mr. Fujino and Mr. Asai, himself. Although the early domestic scene shows that traditional Japanese dress is worn in the homes, everyone wears Western clothing at the workplace. This signifies the split personality that upscale Japanese life was experiencing. But Ayako has a pressing problem. Her father embezzled money from work and made some disastrous financial investments, and now must pay it back or face jail. She asks Susumu, the man she loves, for help, but he doesn’t have the money. Back home, the sharp-tongued Ayako criticises her father for irresponsibly jeopardizing the family, and after a bitter quarrel, she leaves home. Ayako Takes a Desperate Action. Act 2 opens on a modern apartment room, where Ayako is sitting bored and smoking cigarettes. She has left the pharmaceutical company and become Asai’s secret concubine in return for money to help her fa ther out of his jam. Soon she is attending the theatre in the company of Asai, with her hair coiffed like a married woman. One day she runs into Susumu at a department store, and while sharing a tea, he proposes marriage. This is what she has always wanted, but she can’t accept his proposal in her present situation, and she runs away without giving her answer. As was inevitable, Asai’s wife eventually learns of her husband’s amorous liaison, and she imperiously orders her timid husband to return home and end his affair. Ayako’s Appeal to Susumu. Ayako, now free to go to Susumu, asks her maid whether she should tell him about her affair. The maid responds by saying if Susumu really loves her, he will understand. But just then Ayako learns that her brother, Hiroshi, who has been studying at the university, is desperately in need of money to pay his final tuition. So, addressing the new financial problem, she flirts with her other senior admirer, Mr. Fujino, and gets him to pay her money that will be used to cover Hiroshi’s tuition. 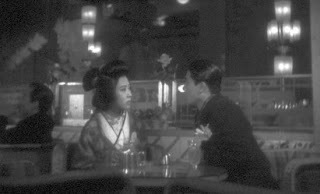 Ayako then rushes to meet Susumu, innocently telling him everything and begging him to marry her. Susumu’s response is hesitant, but Ayako seems confidant everything will work out. The Final Breakup. Mr. Fujino next shows up at the apartment, demanding her affection in payment for his financial contributions. Ayako, now confidant that she has Susumu behind her, rudely and triumphantly dismisses him. But the couple is soon arrested by the police: Fujino has formally accused them of soliciting. During a brutal cross examination at the police station, the fearful Susumu betrays Ayako, saying that she is a fallen woman who deceived him. Ultimately the police let her go, but when she returns to her family, she finds that they all now reject her as a disgraceful “delinquent” and turn her out. She is now completely abandoned, and the final shot shows her walking alone at night on the street facing her uncertain future. Osaka Elegy, which was apparently shot in only twenty days, features a number of hallmark Mizoguchi features. The very carefully composed camera frame always covers a relatively large scope, with almost no closeups. Many of the shots are filmed through a scene with considerable depth, with environmental artifacts in the foreground and well-crafted, dramatic lighting of the subjects that heighten the ambience and sense of environmental context. There is also some excellently contrived camera movements, but nothing like those of his later works. The men in the film are uniformly timid and dominated by their circumstances. They unquestioningly identify with their social institutions and seem reluctant to think for themselves and take initiative. Ayako, by contrast, is naive, but also spirited and relatively enterprising. She is not simply an idealised victim of society, but is instead a more richly developed and believable character that presents an unusually sympathetic examination of the life of a woman in contemporary Japan. In the story told, she has tried to live up to society’s traditional demands for helping her family in difficult circumstances; but while her menfolk seem useless in this regard, she has taken her own initiative and managed to find the needed money. In the end, though, all her efforts are rejected by the hypocrites around her. This will be a recurring theme for the rest of Mizoguchi’s career: Japanese society has only idealized and highly restricted roles for women; there is no place, no support, and no refuge for women who would like to, or need to, live outside of those boundaries. Nevertheless, it seems that despite the prejudicial and unjust society in which she lives, Ayako’s spirit is still unbroken at the end of the film. True, she has become hardened and more cynical by her experience. But she is still a fervent, unbowed human being walking forward to face life’s further vicissitudes. There are cultural and situational aspects to the setting in Osaka Elegy about which one can only speculate. This was 1936, when the world economic situation was not promising, and economic tensions may have been particularly intense. Ayako, who smokes cigarettes and wears Western dress, is a modern woman in a Japan that was undoubtedly experiencing tensions between modernity and the traditional cultural values of feminine modesty. There is in all this a suggestion in the film that even the liberating contributions of modernism appear to provide no secure and respected place for women in Japan. This discouraging social assessment was recognised by the wartime Japanese government, which banned Osaka Elegy as decadent and unsuitable for the national spirit. And yet in my view, the film shows a striking sympathy for the passionate and unvanquishable character of woman. I enjoy the way you breakdown the films into acts.. I have trouble doing that but I think it works well. I was not so sure that the woman remains unbowed at the end.. I thought her presence on the bridge was pretty ominous, and it was nothing like, say, Nights of Cabiria where it's clear there's hope. It seemed like she was just a lost woman, which is what Mizoguchi is condemning. I am an Ozu fan and would like to see what you do with Ozu..